Who would have thought that you could turn McDonald's French-fry used cooking oil into environment-friendly diesel fuel in your kitchen and run your car on it? This is not just a dream, but with some courage, environmental awareness, and help from other knowledgeable people on the Internet, foreigner Keith Addison last week finally succeeded in making "biodiesel". He believes he is the first person to make it in Hong Kong. He has lived in Hong Kong over 10 years, and saw that even in Lantau Island, air pollution is getting worse and worse in recent years. This is one reason why he is trying to promote biodiesel use in Hong Kong. Talking cheerfully, he took a glass of clear gold "biodiesel" fuel and let the reporter smell it. The reporter smelled a slight fragrance, and could hardly believe this could be used as fuel to run a car. It was not that easy. After obtaining the know-how on the Internet, Addison first went to McDonald's and asked for some used cooking oil. Then, in the kitchen, he "transesterified" it, carefully mixed poisonous methanol and lye, and proceeded with the chemical reaction. Although he was confident it would work, he and his partner were surprised when they succeeded. Why is he taking such trouble to make environmental diesel fuel? He was planning an "Environmental Journey", driving 4WDs across Asia and Africa this summer, but using polluting diesel for the vehicles was not suitable, so he looked for a better solution on the Internet. He said the most important aim of making "biodiesel" is to raise the environmental awareness of the government. He showed great regret that, even in Lantau, the air is dirty and often hazy, while Hong Kong's air pollution problem has reached unacceptable levels. According to a Transport Department report, Hong Kong has 150,000 diesel-engined vehicles. 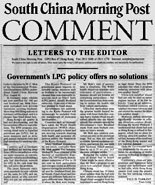 Although the Environment Protection Department (EPD) and the government have been testing LPG-engined taxis, and 18,000 taxis will change to LPG after so many years later, still 130,000 heavy vehicles are using diesel fuel and causing air pollution problems, and this is still not solved. Addison pointed out that "biodiesel" can be used in all diesel engined vehicles, with no need for modification, not only decreasing the air pollution, but also adding no extra expense for taxis or truck drivers. Other countries have already developed the use of vegetable oil to make environmentally friendly "biodiesel" for a long time, greatly decreasing the amount of black smoke and hazardous exhaust fumes by 40 to 60 per cent. However, Hong Kong's Environmental Protection Department says that biodiesel "could increase emissions of Nitrogen Oxides" and for this reason, has rejected introducing this kind of environmental diesel fuel, although it is used in USA, Germany, and other countries. Christine Loh of the Citizens' Party, which she said had investigated "biodiesel", criticized the EPD for being shortsighted in not introducing this kind of new environmental technology. She pointed out that from other countries' experience, biodiesel exhaust is cleaner than ordinary diesel (no Sulphur Dioxide or lead), and produces much less black smoke and other pollutants compared to ordinary diesel. She said the EPD totally rejecting biodiesel because "Nitrogen Oxide emissions could increase, thus polluting the air" is not fair. Environmentalist Addison said the EPD's objection could be based on mistaken data. According to Professor Kerr Walker, a British specialist on biodiesel, in a 1994 study, vehicle operators need only adjust the diesel engine's injection timing and decrease the engine running temperature, and the amount of Nitrogen Oxide in biodiesel emissions could be decreased to below the level of ordinary diesel fuel. Better Environment Hong Kong (BEHK) and KMB (Kowloon Motor Bus) tested biodiesel fuel, and found that mixing ordinary diesel fuel with biodiesel made of BBQ oil collected from restaurants reduced bus engine black smoke by 7% without losing any power. BEHK plans to conduct a six-month road test from mid-August of 60 buses, minibuses, taxis and trucks, and hopes to convince the government to help introduce environmentally clean biodiesel to Hong Kong and reduce black smoke pollution. BEHK spokesman Choi Sau-yim said if the group succeeded, it could help food industries collect used fry oil and BBQ oil, reduce the cost of dirty used oil disposal, and have a beneficial environmental effect. Mr. Choi said the group plans to produce a full report by next March, and will lobby the government and the Legislative Council to introduce biodiesel technology in Hong Kong. The estimated cost of the investigation is about $600,000. KMB engineering manager Shum Yuet-hung was satisfied with the initial test results, and said he was willing to go ahead with the second-stage road tests with the cooperation of BEHK. BEHK member Dr Dennis Leung Yiu-cheong, an associate professor at the University of Hong Kong Department of Mechanical Engineering, said that in Europe and the US, where the temperature is moderate, mostly vegetable oil is used for biodiesel. He said because Hong Kong's weather is warmer, animal fat, which doen't contain sulphur, does not solidify, so it can be used to make more environmentally friendly biodiesel. "Buses using biodiesel would not have their engine output torque and engine output power seriously affected." MIXING a fuel made from animal fats with conventional diesel could reduce emission of smoke and pollutants by vehicles, according to tests carried out by Kowloon Motor Bus (KMB). At the same time, engine power can be maintained at a satisfactory level, proving that the product, biodiesel, aids environmental protection. "Bio-diesel is produced from waste-animal fats, which help fully utilize natural resources. Besides, it can help lower the smoke level as well," KMB engineering manager Shum Yuet-hung said yesterday. He said bus engine parts did not have to be changed to use biodiesel. University of Hong Kong Department of Mechanical Engineering associate professor Dennis Leung Yiu-cheong said: "For the tests we conducted on biodiesel, we used waste-animal fats from restaurants as they release less nitrogen dioxide than vegetable fats." A biodiesel test was carried out by Better Environment Hong Kong (BEHK) about six months ago. BEHK director Steve Choi Sau-yim said: "More tests will be carried out on blending different proportional contents of biodiesel in conventional diesel fuel, which aims to find out the best combination." More tests are planned but KMB refused to say when vehicles would use biodiesel. Although the Environmental Protection Department (EPD) has a negative attitude to this possibility of reducing black, dirty polluting diesel exhaust, KMB (Kowloon Motor Bus) yesterday conducted an initial test of biodiesel, using biodiesel fuel additive made from used cooking fat from grilling pork, with the result that black smoke was reduced by 7%. Encouraged by the test result, KMB is considering using this biodiesel made of recycled waste in road tests, to decrease air pollution. KMB is the first public company introducing biodiesel. However, KMB engineering manager Shum Yuet-hung admitted that he could not say what effect adding biodiesel to ordinary diesel fuel will have on ticket prices. But he said it would be worth it considering the environmental improvement. Biodiesel is made of plant oils or animal fat, not fossil fuel. It not only reduces black smoke, it reduces poisonous lead and Sulphur Dioxide emissions to virtually zero. Some developed countries like the US have introduced it to reduce air pollution. However, the EPD has reserved judgment because biodiesel could increase Nitrogen Oxides (a pollutant) in the exhaust compared with ordinary diesel. KMB's Mr. Shum said they will test the Nitrogen Oxide emissions in future biodiesel trials. Mr. Shum said KMB had tested a pure vegetable oil biodiesel made in Germany, but because the price was several times more than ordinary diesel they had abandoned it. Instead KMB recently began cooperating with the University of Hong Kong and Better Environment Hong Kong. An HKU associate professer studied the use of waste cooking oil from grilling pork and made biodiesel for the KMB test. Yesterday's tests used mixtures of biodiesel with ordinary diesel ranging from 10 to 15%, run separately on a KMB Cummins LT10 diesel test engine. The result showed the 15% mixture decreased black smoke by 7%, although the power decreased slightly and fuel consumption increased by 1.7%. KMB expressed satisfaction with this result and will continue investigating the best mixture of biodiesel with ordinary diesel fuel. After more detailed investigation, the company will consider whether to use it in buses. It will also need to consider the biodiesel supply problem. KMB (Kowloon Motor Bus) and Better Environment Hong Kong (BEHK) conducted a test of biodiesel to replace ordinary diesel fuel, and the result of the initial study was good. However, it still needs more detailed study before they try it on the road. Leung Yiu-cheong, an associate professor at the University of Hong Kong Department of Mechanical Engineering, who conducted the test, explained that in this test they had used animal fat used for BBQ to make biodiesel, mixed it at a ratio of 10-15% with ordinary diesel fuel, and tested it in a bus engine. The results were that the more biodiesel was in the fuel the more the black smoke decreased, although engine power also decreased slightly. This will help to solve the air pollution problem. KMB engineering manager Shum Yuet-hung said the test result was satisfactory. He emphasized the bus engines do not need to be modified to use biodiesel. But since the biodiesel study is still in the early stages and further improvements can be made, KMB does not plan to use it yet. Mr. Leung added that this was the first test, and their aim is to find the optimum amount of biodiesel to mix with ordinary diesel. He said they will continue trying different proportions of biodiesel in the mix. He also said that using animal fat to make biodiesel decreases exhaust Nitrogen Dioxide and pollutant particles compared with biodiesel made from vegetable oil. Today, overseas countries produce large amounts of ordinary diesel and biodiesel, and the prices are very similar. But if we produce a large amount of biodiesel in Hong Kong, Mr. Leung thinks the biggest problem will be collection and transport. Another BEHK member conducting the tests, Choi Sau-yim, said in the second stage of the study, in addition to the bus tests, they plan to use 60 vehicles of different kinds, including taxis, minibuses and others, for six months of tests. After coordinating the results, the BEHK plans to submit its report to the Legislative Council for consideration. Making biodiesel fuel from animal fats and plant oils to decrease air pollution -- is this be the way to go? Although the Environmental Protection Department (EPD) says "No", a minibus industry association plans to test biodiesel in 20 minibuses on the road in October, in cooperation with Better Environment Hong Kong. This biodiesel, which KMB (Kowloon Motor Bus) also tested in a bus engine last Saturday, is made from used BBQ oil from restaurants. By adding methanol in a chemical reaction, the cooking oil can be made into fuel to run diesel engines, without having to modify the engines. Hong Kong-Kowloon-New Territories public minibus association chairman Mr. Leung Hung said they wanted to try biodiesel in 20 minibuses, both new and old, on short and long-range routes, to test the effect. He said taxis using LPG (Liquid Petroleum Gas) faced a lack of filling stations, while there were very few mechanics qualified for LPG, and maintenance costs and fuel costs were a problem. He hoped that by studying the effect of biodiesel a better solution could be found to improve the environment. Recently, quite a few people are promoting biodiesel in Hong Kong. A commercial organization is trying to introduce biodiesel from Malaysia, and two foreign journalists in Lantau made their own biodiesel at home in their kichen from McDonald's used cooking oil, planning to drive their cars from Hong Kong to South Africa. However, the Hong Kong government is not enthusiastic about biodiesel. An EPD spokesman said: "Using biodiesel as a fuel for vehicles could increase Nitrogen Oxide (NOx) emissions in exhaust gas. NOx is already high in Hong Kong's Air Pollution Index, so using biodiesel will not improve Hong Kong's air pollution problem." However, a US Department of Energy website says NOx emissions with biodiesel are "similar or much less" compared to petro diesel, depending on the engine and tests used. The chairman of Better Environment Hong Kong, Mr. Choi Sau-yim, said: "The key is in the materials used. If animal fats are used to make biodiesel, it can cut NOx in the exhaust to about 5 to 10% less than petro diesel, while plant oil biodiesel increases it by 15%. If you choose the material (the origin of the cooking oil) carefully, it's not difficult to solve the NOx problem." He also believes Hong Kong is more suitable for biodiesel than other countries. Because Hong Kong cooking uses more animal fat, the NOx problem can be more easily solved, the temperature is high so there is no danger that the animal oil will solidify in the engine, and the city area is concentrated which makes it easier to collect the used cooking oil. Currently in Hong Kong a litre of diesel costs HK$5.90 per litre including tax, Choi said. In the US biodiesel made from soybean oil costs about HK$6.00, and biodiesel made from other vegetable oils cost is about HK$3.00. In Hong Kong, the tax situation for biodiesel is unclear, so it is difficult to calculate what the cost of biodiesel will be in Hong Kong. BEHK, academics and transport organizations plan to cooperate in negotiating with the EPD next March, and will conduct detailed tests hoping to provide a foundation for policy discussions. On April 2 Paul Kember suggested in the South China Morning Post that the Government introduce biodiesel instead of liquid petroleum gas to cut air pollution. He said biodiesel was a non-toxic fuel made from vegetable oils, and could be used in diesel engines without conversion, with immediate emission reductions and no need for new filling stations, and it could be made from used cooking oil, a toxic waste. "Information can be found on the Internet," he said. "Just Net search 'biodiesel'." We'd done that some months before and found thousands of research reports, results of field tests totalling millions of miles, and even do-it-yourself kitchen recipes. There's certainly no mystery about biodiesel -- except in Hong Kong, it seems, where some strange statements have been made recently. We're interested in do-it-yourself biodiesel: we're organizing a long-range overland expedition with an environmental angle (Journey to Forever) and we want to use renewable fuels for our Land Rovers, one of which is a diesel. So we brewed up some biodiesel in our kitchen from used cooking oil we got from McDonald's. On April 22 we put it in the Land Rover and it ran like a dream and smelled like a bunch of roses! Well, French fried roses anyway. Biodiesel exhaust doesn't stink. On April 30 Ming Pao Daily published an article about this, but the Environmental Protection Department said it has rejected biodiesel because it increases Nitrous Oxide (NOx) emissions. Legislator Christine Loh said the EPD was being "short-sighted", and we quoted some scientific references to show it was wrong. 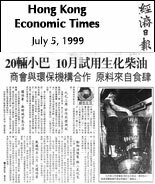 Two weeks later the EPD told Ming Pao that it still had doubts about NOx but now had an open mind about biodiesel and would investigate further, since we'd shown it could be made by recycling used cooking oil, giving it a dual purpose. Later Ms Loh confirmed to us that the EPD had changed its stance. But three weeks ago the EPD told a Hong Kong Economic Times reporter it rejected biodiesel because it increases NOx emissions. What happened to its "open mind"? Does biodiesel increase NOx emissions? Sometimes yes, sometimes no, but it doesn't matter. According to research (lots of it), there are reliable and proven ways of reducing biodiesel NOx emissions to below ordinary diesel fuel levels, by retarding the engine injection timing, and also by using additives and catalytic converters. In one case using these techniques, certified emissions for diesel buses by the US Environmental Protection Agency showed NOx reductions of up to 28% less than conventional diesel fuel levels. NOx is not an issue with biodiesel. Meanwhile work is going ahead here with biodiesel, but is apparently being skewed by the EPD's stance on NOx. - Animal-fat biodiesel cuts NOx emissions to 5-10% less than ordinary diesel fuel, while vegetable-oil biodiesel increases NOx by 15%. - Animal fat biodiesel has lower NOx and particulate matter (PM) emissions than biodiesel made from vegetable oil. Some studies have shown lower NOx emissions with animal-fat biodiesel than with virgin vegetable oils, because fats have different combustion characteristics. However, recycled oils and palm oils have similar profiles to fats -- there is little difference between NOx emissions from animal-fat biodiesel and biodiesel made from used vegetable cooking oils or from palm oil. The 28% NOx reduction certified by the US EPA cited above was with vegetable-oil biodiesel, and was coupled with a 25% PM reduction. Claiming that animal-fat biodiesel is safer could mean missing the opportunity to recycle all used cooking oils into biodiesel and would greatly reduce the amount of biodiesel that could be made in Hong Kong, and raise the cost. Keith Addison is right to ask the Environmental Protection Department to explain its shilly shallying on biodiesel (letter South China Morning Post July 20). All too often bright ideas are dismissed out of hand by Hong Kong's government bodies unless and until a multi-million dollar study is conducted. The Government has rejected the A21 additive allowing water to be added to diesel and a massive reduction in nitrous oxide and particulates. It refuses to allow diesel-conversion kits, arguing they may not be carried out properly and thereby prove a hazard. It refuses to give the concessions that would encourage the use of electric vehicles. Various reasons are given, mostly relating to "lack of power", "limited range", etc. This is despite China Light & Power's (CLP) 10-plus-year experiment proving its electric vehicles can tackle the Jat's Incline as well as their diesel equivalents; that milk has been delivered by electric vehicles to houses at the top of steep hills in the UK for the past 50 years; and the range available now is more than enough for a range of operations. It even stifled the KMB/CLP electric airport coach concept. The Government has always sought the impossible 100 per cent solution to any problem, ignoring the fact that every option, no matter how limited its application, will make a meaningful contribution. 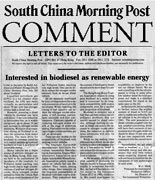 I refer to the letter by Keith Addison and Midori Hiraga (South China Morning Post, July 20) about biodiesel. Liquefied petroleum gas (LPG) is a lot cleaner than biodiesel. An LPG taxi emits virtually no particulates and about 70 per cent less nitrogen oxides than a diesel taxi. However, powering a diesel vehicle by biodiesel can have only about 15 per cent reduction in particulates but, as is widely recognized, up to about 14 per cent increase in nitrogen oxides emissions. We know of no countries relying on biodiesel to reduce the emissions from motor vehicles. The main drive for biodiesel in overseas countries is to exploit surplus agricultural products or treat it as a form of renewable energy. Motor vehicles are a major source of ambient nitrogen oxides in Hong Kong. This year, we have so far encountered 28 incidents of the roadside Air Pollution Index reaching very high levels due to high concentrations of ambient nitrogen dioxide. More nitrogen oxides emissions from the vehicle fleet will cause more incidents of the Air Pollution Index reaching very high levels. One can do little to reduce the nitrogen oxides emission from an in-use diesel vehicle. All the measures mentioned by your correspondents have severe constraints or have yet to be developed. While retarding the timing of fuel injection can reduce the nitrogen oxides emissions, it will increase particulates emission and fuel consumption. Catalysts capable of reducing nitrogen oxides are still at the stage of prototype testing. Fuel additives for reducing nitrogen oxides emission are not yet developed. There are also doubts on the compatibility of biodiesel with existing motor vehicles. The American Automobile Manufacturers Association, European Automobile Manufacturers Association, Engine Manufacturers Association and Japan Automobile Manufacturers Association jointly issued a report on vehicle fuel last December. They raised, among other things, their concerns on the long-term compatibility of biodiesel with their engine components. They considered that the content of biodiesel in diesel should not be more than five per cent. The Hong Kong Motor Traders Association objects to using pure biodiesel as a motor fuel and is concerned by its long-term compatibility with engine components even for a smaller mix proportion of biodiesel. Biodiesel is certainly not a fuel that can help reduce our air pollution problems that are mainly caused by diesel vehicles. Although limiting its content in diesel can reduce the increase in nitrogen oxides emissions, the reduction in particulates emissions will also be diminished. While we are seeking clean alternatives to diesel, we are also looking to ultra-low sulphur diesel as a less polluting diesel. It can reduce the emissions of both particulates and nitrogen oxides from a vehicle. At the moment, the oil refineries capable of producing the fuel are mainly in Europe and its supply is somewhat limited. But, the fuel will become a norm for diesel in the European Union (EU) in 2005, tentatively. We would thus expect its availability to improve in the not too distant future. We are now consulting with the oil companies to bring in some ultra-low sulphur diesel for trial purposes and make it a standard requirement for diesel at the same pace as the EU. In the interim, we are seeking to further reduce the sulphur content of diesel to 0.035 per cent to enable less polluting diesel vehicles to be introduced in 2001. The new generation of diesel vehicles coupled with the less sulphur-containing diesel will have their emission of particulates and nitrogen oxides reduced by about 33 per cent and 30 per cent respectively when compared with the current models. Nevertheless, we are interested in biodiesel as a form of renewable energy and also any means that may help reduce waste requiring disposal and will continue to examine the development of new technologies in such areas. 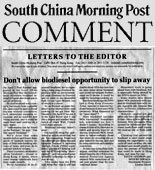 I refer to the letter by W. C. Mok of the Environmental Protection Department (EPD), on biodiesel (South China Morning Post, August 4). In Germany many vehicles are now certified for 100 per cent biodiesel use. Most European carmakers now provide warranties covering biodiesel. More than 900 filling stations in Germany sell biodiesel, and it is cheaper than fossil diesel fuel. Hong Kong's air quality is bad and deteriorating, and the Government offers no real solutions. The EPD proposes converting diesel taxis to liquefied petroleum gas (LPG), but ignores measures such as stringent annual emissions tests and high penalties for smoking vehicles. Countries such as Germany and Holland are moving away from LPG to cut pollution while we waste resources on converting a few vehicles and building a new fuel distribution network for LPG in the vain hope that this will solve the problem. The latest Japanese emissions standards for new vehicles are the same for LPG and unleaded petrol, so why convert? Why not just use unleaded petrol? The Kyoto Protocol on greenhouse gases requires renewable energy resources such as biofuels to be increasingly cheaper than non-renewable resources such as fossil fuels (LPG, petrol, diesel). Biodiesel emits only 10 per cent of the carbon emitted by fossil diesel. Governments not conforming to the Kyoto Protocol will increasingly be excluded from the mainstream of economic development. Countries such as Germany have taken the World Health Organization (WHO) objectives for air quality to heart and are moving towards meeting both health and economic objectives within the framework of the Kyoto Protocol. Many biodiesel dynamometer test results contradict those Mr Mok quotes. For instance, Michael E. Starr (Journal of the Society of Automotive Engineers, US, 1997) clearly demonstrates reductions of five to 20 per cent in both particulates and nitrogen oxides at different injector timings for pure biodiesel and for biodiesel/fossil diesel blends. Fossil diesel and biodiesel are different fuels and require different tests. Maybe this is where Mr Mok went wrong. Mr Mok's view of particulates is simplistic. The WHO health objectives stipulate zero tolerance of particulates - humans should not breathe air containing particulates - but the Government has done nothing to reduce the health risk from vehicle particulates. Ultra-fine particulates pose the greatest health hazard because with fossil fuels they contain heavy metals which are absorbed directly into our bloodstream; this remains outside the Government's view. Biodiesel made from pure biofuels contains no heavy metals. Mr Mok says catalytic converters are only in the prototype stage. Not so, they are readily available. Special oxidation catalytic converters for use with pure biodiesel reduce particulates by up to 50 per cent, and decrease nitrogen oxides. Reducing the sulphur content of diesel fuel in South China might be more effective than Mr Mok's proposal to use ultra-low-sulphur diesel in Hong Kong. Chinese diesel has 10 times more sulphur than the fuel sold here. Almost as much half-price illegal diesel smuggled from the mainland is used in Hong Kong as legal diesel. Does the EPD calculate this when it proposes reducing emissions with ultra-low-sulphur diesel? Ultra-low-sulphur diesel fuel can only be used on newer engines because of its low lubricity. Used as an additive, biodiesel (which contains no sulphur) increases lubricity and can extend the market for ultra-low-sulphur diesel. However, carbon emissions significantly increase in refining ultra-low-sulphur diesel, flouting the Kyoto Protocol. I understand that diesel fuel sold in Hong Kong is refined in Singapore, which has no plans for refining ultra-low-sulphur diesel fuel, because of the small size of the Hong Kong market and low regional demand. Does the Government have any program for its own vehicles for developing or implementing technology to improve air quality? California's clean-air programs and legislation have created new technologies such as fuel cells, while Hong Kong cannot even raise the penalty for the few smoking vehicles ticketed. A minibus using fuel made from sunflower oil drove from Central to Repulse Bay yesterday. It took the company which wants to import and distribute the oil, widely used in Germany, 18 months to get permission for the 10-kilometre journey. "We started explaining what we wanted to do to the Environmental Protection Department a year and a half ago," said Russell Sung Yan-tak, manager of Sunland. "They have given us feedback which is helping us develop ... After many letters we got permission for this small demonstration." Driver Choi Hang-wan took a drink of the fuel and said: "It tastes fine. It's OK," although officials are unlikely to recommend the practise. Principal Environmental Protection Officer Mok Wai-chuen said biodiesel was 15 per cent less polluting than diesel, but LPG, which the Government is trying to introduce, achieved a 70 per cent reduction. Bio-diesel increased nitrogen dioxide emissions, Mr Mok said. Mr Sung has the support of Citizens Party legislator Christine Loh Kung-wai. "There are so many possibilities and interesting commercial opportunities in this area, and it's encouraging that Hong Kong companies want to do something," she said. "There should be an environment that will allow people to use different fuels with lower air pollutants." Minibus driver Choi Hang-wan takes a drink of the biodiesel after the test drive from Central to Repulse Bay. "It tastes fine," he said.